Participants were especially good at spotting scene changes that involved LEGO people. Image from LaPointe et al. Our brains are wired such that we pay extra attention to anything that seems to be alive. This makes sense from an evolutionary point of view – after all, other living things might be about to eat us, or maybe we could eat them. Consistent with this evolutionary perspective, prior research has shown that at a very basic level, we pay more attention to images of animals and people than we do to cars and trucks, even though in modern life, it is cars and trucks that are more of an everyday threat than animals. But now a study in the Canadian Journal of Experimental Psychology has shown that this bias for processing living things extends to LEGO people, despite the fact that they are inanimate and were obviously never encountered by our distant ancestors. Mitchell LaPointe and his colleagues tested dozens of undergrad students across several studies. The basic challenge was similar throughout. On each experimental trial, the participants looked at a pair of black and white, static images of LEGO scenes that alternated rapidly on a computer screen (each scene appeared for a quarter of a second before it flicked to the other scene in the pair and back again), and they had to indicate as fast as possible when they'd spotted the difference between the two scenes, and which side of the screen the change was on. After the participant responded, the next pair of images appeared and began flicking back and forth until a response was made. Both LEGO scenes within each of the image pairs was identical but for one small difference, which was either the addition of an extra LEGO person or some other feature, such as a tree or a small tower of LEGO blocks of similar size to a LEGO person. The main finding is that participants were significantly quicker by two or more seconds, on average, at spotting scene changes that involved a LEGO person as compared with some other LEGO element. They were also more accurate at reporting where the changes had occurred when they involved LEGO people. Variations in the methodology showed that the attentional bias for LEGO people was not due to their having faces (the advantage remained even when these were blurred). Even rotating the scenes 180 degrees, or blurring the entire scene, failed to fully eliminate the participants' superior performance for spotting changes involving LEGO people. This finding for LEGO people was very similar to that shown previously in terms of people spotting scene changes more quickly and accurately when they involve humans and animals as opposed to motorised vehicles (in fact, the LEGO person advantage was in some ways more robust – the attentional bias for humans and animals over vehicles disappeared when scenes were rotated 180 degrees). The researchers who conducted the new research said, "it is clear that our participants treated LEGO people differently than LEGO nonpeople. The explanation that we favour for this difference in performance is that the animate category was generalised to the LEGO people, perhaps because the LEGO people contain some feature overlap with animate objects." In other words, your brain thinks the little LEGO characters are alive! 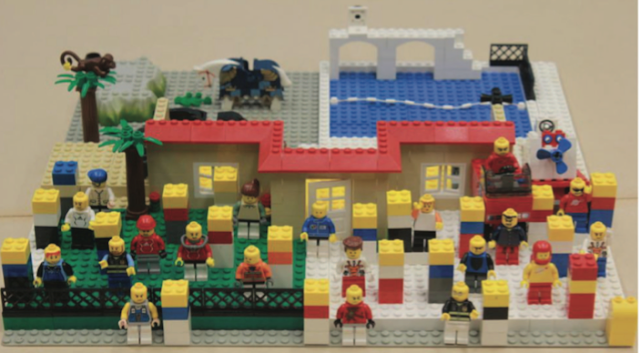 What's not clear from this research is if experience with LEGO figures is required for the attentional bias for LEGO people to be observed (no detail is given in the study on whether or how much the participants had played with LEGO as children, or adults). We also don't know if these results say something special about LEGO people or if a similar effect would be found for other toy figures.